Peripheral T-cell lymphomas (PTCL) are a diverse group of aggressive non-Hodgkin's lymphomas, originating from mature T-cells and are usually associated with a poor outcome. PTCL, not otherwise specified (PTCL-NOS) is the most common subtype with no characteristic clinical or immunophenotypic features. Presentations widely vary depending on the subtype and part of the body which is affected. Although various subtypes are described, evidence lacks a clear definition of certain varieties. We describe a patient having widespread multicentric spinal vertebral involvement with associated epidural lesions, presenting with cauda equina syndrome. Such extensive spinal involvement on late presentation was perplexing and difficult to manage; hence, we considered reporting this case. A 68-year-old male had complaints of progressive low back pain over a prolonged period of time, for which he sought intervention elsewhere. There, he underwent vertebroplasty and certain investigations for a pathological compression fracture of L4, but, ultimately, his underlying condition remained undiagnosed as biopsy was not performed. Pain was his only predominant symptom but eventually he started to lose weight in a rapid manner and subsequently developed fever. He later presented to us after a month, having worsened symptoms leading to significant functional impairment. General examination revealed right axillary and right iliac lymphadenopathy. Neurological examination revealed bilateral motor weakness of L3-S1, absent ankle reflexes, bowel and bladder incontinence, and saddle and perineal hypoesthesia; all favoring cauda equina syndrome. Blood investigations were otherwise normal, except for band cell left shift, occasional metamyelocytes, and elevated erythrocyte sedimentation rate. 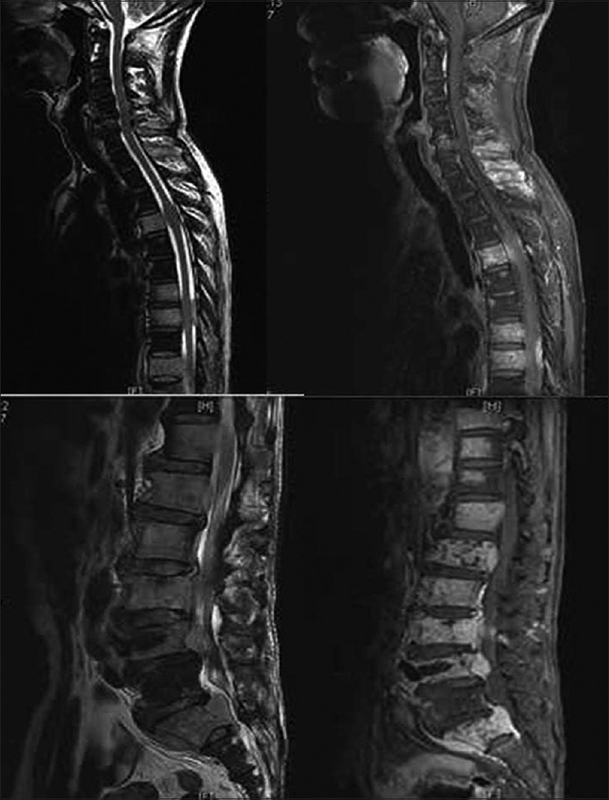 Initial X-rays were nonspecific with multiple lytic permeating bone lesions and spots of sclerosis in L3–L5 vertebral bodies. Magnetic resonance imaging showed obvious extensive multicentric osseous lesions involving cervical (C6–C7), thoracic (T4, T7–T8, and T9–T12), lumbar (L1–L4), and sacral (S1) vertebras; isointense in T1-weighted images and isointense to hyperintense in T2-weighted images [Figure 1]. 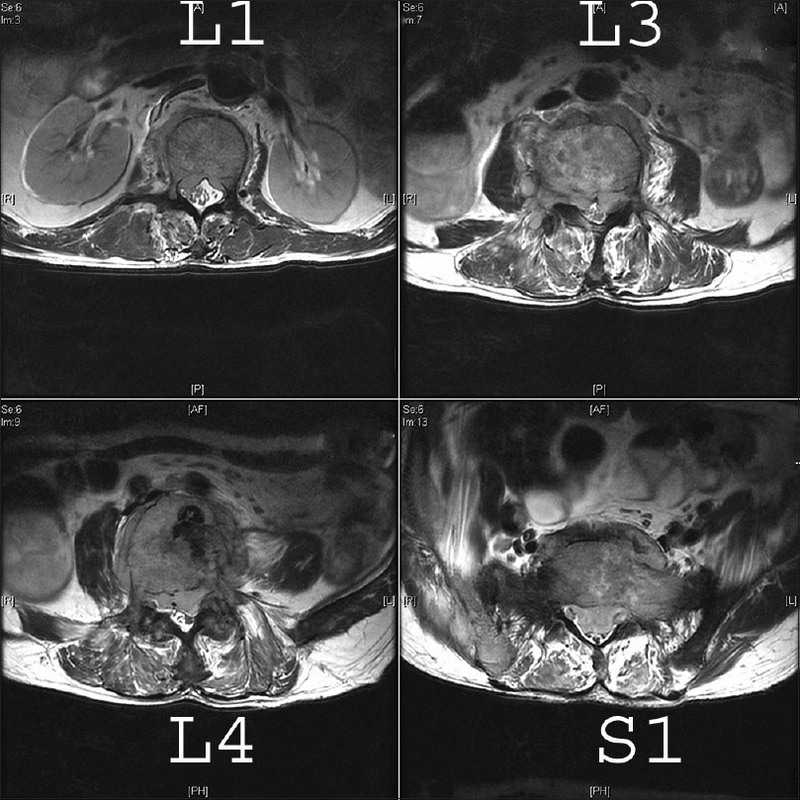 Associated epidural mass was noticed in T8, L1, L3–L4, and S1 levels, of which mass corresponding to L1, L3–L4, and S1 was causing significant spinal canal compromise [Figure 2]. Technetium 99 and gallium 67 bone scan showed increased uptake of radioisotope, demonstrating active lesions in various levels of spine and in the right seventh rib; however, positron emission tomography/computed tomography was not performed. Considering the B-symptoms (fever, night sweats, and weight loss), investigations, and imaging findings, there was a dilemma whether this could be due to infection, a rare presentation of tuberculosis; yet, the possibility of metastatic tumors, especially lymphoma was not ruled out. Cauda equina syndrome prompted an emergency decompression and removal of epidural mass. Hence, posterior decompression at L1 and L3–S1 levels was done to remove the epidural mass for achieving comprehensive decompression. Bony fragments of the removed posterior elements and specimens of epidural mass were sent for biopsy and culture. In addition, a needle biopsy from sacrum (S1) was also taken, with intention to integrate findings with that of other specimens to facilitate diagnosis. Following surgery, neurological status improved; yet, underlying disease had to be precisely diagnosed, classified, and managed. Histopathology revealed diffuse atypical lymphoid infiltrates, which mostly consisted of small lymphoid cells with slightly irregular nuclei, along with poorly formed granulomas [Figure 3]a and [Figure 3]b. On immunohistochemical study, the tumor cells were positive for CD3 and CD4 but negative for CD20, CD8, TIA-1, CD30, CD56, and CD10 [Figure 3]c and [Figure 3]d. No diagnostic Reed–Sternberg cells were found. PAS stain showed no fungi, and acid-fast stain showed no acid-fast bacilli; cultures were negative. Based on the morphologic and immunophenotypic features, a diagnosis of PTCL-NOS was made. Computed tomography scan for staging showed multiple enlarged lymph nodes at right axillary, paraaortic and right iliac regions. Bone marrow biopsy revealed infiltrates of similar tumor cells, depicting a Stage 4 disease. The patient received chemotherapy of cyclophosphamide, doxorubicin, vincristine, and prednisone (CHOP) regimen. However, terminal stage of the disease was refractory to treatment and patient eventually succumbed to the disease in the following month. PTCL refers to a group of mature postthymic T-cell lymphomas. They constitute for 10%–15% of non-Hodgkin's lymphomas. Many subtypes are described, among which, PTCL-NOS is the major subtype; yet, all are considered to be high-grade lymphomas. They tend to disseminate into one or more extranodal sites including bone marrow, liver, spleen, lung, and skin. Our patient had multicentric involvement of all regions of spine including a part of cervical, thoracic, lumbar, and sacral vertebras with associated epidural lesions. Such extensive Stage IV involvement is extremely rare and susceptible for poor prognosis. Most patients present with B-symptoms as in our case, but this is not pathognomonic for the disease. Other symptoms depend on the site of involvement. During initial presentation, we thought this could be of tuberculosis etiology, considering the clinical symptoms and the high prevalence of tuberculosis. X-ray and magnetic resonance imaging could only provide a nonspecific interpretation, but biopsy proved to be the key for diagnosis. Morphologic variations among subtypes can be puzzling, but immunophenotyping can unveil the absolute classification., Yet, differentiating variables within subtypes is not clearly defined. Usually, PTCL patients present during advanced stages of disease and their overall survival rate is very less. The same was the scenario in our patient who presented with multifocal involvement. This puts forth a potential challenge for treatment. Even though 5-year overall survival rate and 5-year failure-free survival rate for PTCL are very less, early intervention can effectively prolong the survival. At present, a tailored therapy for PTCL is not in practice, and front-line therapy is usually a combination of cyclophosphamide, doxorubicin, vincristine, and prednisone (CHOP regimen)., The same was followed in our patient but was ineffective. Considering the inadequacy and durability of present treatment protocols, newer combinations and alternative strategies need to be developed. This report portrays a rare presentation of PTCL-NOS Stage 4, with extensive multicentric involvement of spine on late presentation. Even though symptoms and certain investigations suggested an infective etiology, histopathology and immunophenotyping revealed the underlying disorder. However, terminal stage of the disease did not respond well to chemotherapy. The impact of late presentation on the survival rate is perceived. We report this case to emphasize that early signs should not be ignored and carrying out a biopsy at the earliest can give a definitive diagnosis, thereby prompting expeditious intervention to increase the survival of the patient. Foss FM, Zinzani PL, Vose JM, Gascoyne RD, Rosen ST, Tobinai K, et al. Peripheral T-cell lymphoma. Blood 2011;117:6756-67. Jaffe ES, Nicolae A, Pittaluga S. Peripheral T-cell and NK-cell lymphomas in the WHO classification: Pearls and pitfalls. Mod Pathol 2013;26 Suppl 1:S71-87. Lage LA, Cabral TC, Costa Rde O, Gonçalves Mde C, Levy D, Zerbini MC, et al. Primary nodal peripheral T-cell lymphomas: Diagnosis and therapeutic considerations. Rev Bras Hematol Hemoter 2015;37:277-84. Zhang Y, Xu W, Liu H, Li J. Therapeutic options in peripheral T cell lymphoma. J Hematol Oncol 2016;9:37. Rüdiger T, Weisenburger DD, Anderson JR, Armitage JO, Diebold J, MacLennan KA, et al. Peripheral T-cell lymphoma (excluding anaplastic large-cell lymphoma): Results from the non-Hodgkin's lymphoma classification project. Ann Oncol 2002;13:140-9. Abramson JS, Feldman T, Kroll-Desrosiers AR, Muffly LS, Winer E, Flowers CR, et al. Peripheral T-cell lymphomas in a large US multicenter cohort: Prognostication in the modern era including impact of frontline therapy. Ann Oncol 2014;25:2211-7. Hsi ED, Said J, Macon WR, Rodig SJ, Ondrejka SL, Gascoyne RD, et al. Diagnostic accuracy of a defined immunophenotypic and molecular genetic approach for peripheral T/NK-cell lymphomas. A North American PTCL study group project. Am J Surg Pathol 2014;38:768-75. Weisenburger DD, Savage KJ, Harris NL, Gascoyne RD, Jaffe ES, MacLennan KA, et al. Peripheral T-cell lymphoma, not otherwise specified: A report of 340 cases from the international peripheral T-cell lymphoma project. Blood 2011;117:3402-8. Coiffier B, Federico M, Caballero D, Dearden C, Morschhauser F, Jäger U, et al. Therapeutic options in relapsed or refractory peripheral T-cell lymphoma. Cancer Treat Rev 2014;40:1080-8. Beaven AW, Diehl LF. 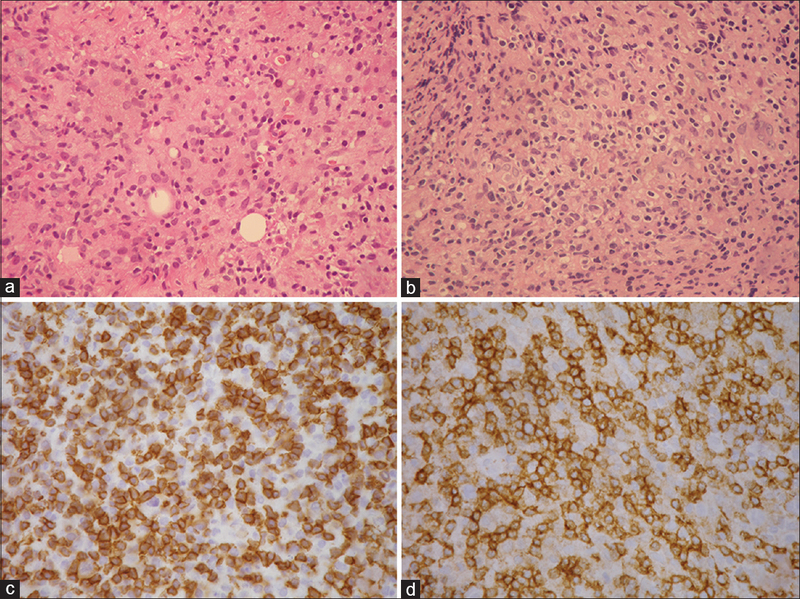 Peripheral T-cell lymphoma, NOS, and anaplastic large cell lymphoma. Hematology Am Soc Hematol Educ Program 2015;2015:550-8.